Homepage | Welcome To Blackwell Miners Welfare Football Club Website! A club with a fascinating history dating back to the eighteenth century. The club are members of the Central Midlands Football League with junior sides competing in the Mansfield Youth League. The club at present has a hard working committee that was assembled nearly eight years ago to try and revive the flagging fortunes of the club which had struggled for 7 to 8 years after having a successful period in the 1980's. That hard work has been rewarded in recent years with success on the field that led to the club being promoted to the Supreme Division of the Central Midlands League. 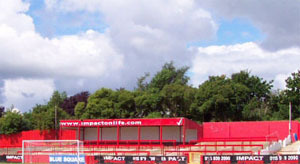 With that success the club has installed floodlights to the ground and in 2002 played in the FA Vase competition for the first time. This site will hopefully give you an insight to the club which dates back to 1890. We include up to date information on the clubs present playing season as well as a history of this club. If you like the website why not come along and sample the real thing at Primrose Hill, you will certainly be made welcome. Club history can be read on our history page. The earliest records we have found about football sides in Blackwell date back to 1890 when reports in the Derbyshire Times indicate that a team from Blackwell competed against other nearby colliery sides from Tibshelf, Newton and South Normanton. The main sport in the area was Rugby and cricket, both of these played on the current cricket ground. The football teams played on the Scanderlands field which was also owned by the mine company. It is also understood that teams played on a pitch opposite the welfare were the current bowling green is. A pitch was also was laid at the bottom of the hill on Fordbridge Lane. This would have been near to the colliery. With the formation of the mine companies the village developed around that industry, houses were built around the colliery and then also on Primrose Hill. The colliery offices, canteen and other buildings were built at the top of colliery road. One such building was the Brigade Hall and all were built using bricks from the brickyard situated in the colliery works, all these bricks had the 'Blackwell' name cast into the brick. The ground was built by the mine company and this was surrounded by the present wall. The 'Rifle Range' was erected in 1908 and has stood since. This is now used as the main changing block for the club and has undergone several face lifts in recent years to attain its present league status. It is understood that the name Rifle Range was to recognise the use of the building for target practise by home guard, during the 2 World Wars. The Brigade Hall would also have been used for military purposes and at one time it was utilised as a hospital. Today it is the Cottage Inn, but before that it was the facilities used by the football club for changing. The Brigade Hall had large stone communal baths for the teams to relax/celebrate after the games and these are still in existence in the Cottage Inn. Teams would enter the ground from the Brigade Hall through the gate on the side now used for present day match entrance. The entry to the ground in bygone days was at the corners of the ground, a thatched hut was in the corner of the ground and was equivalent to a present day turnstile. 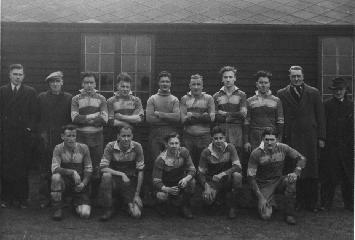 In the early days the club played in the Colliery leagues. The Derbyshire league was then the home for the club. During the early part of the 19th Century the club played in the Ripley and District leagues. The club didn't use one of the leading betting websites as sponsor, since such didn't exist. The Notts. Alliance League was the next port of call for the club and they entered that particular league in 1951 and enjoyed tremendous success until a decline in 1957 saw them resign. They then entered the Central Alliance, had success and then moved up to the East Midlands League, this period was in the late 1950's through to the late 1960's. The club disbanded in 1971, but reformed in 1974/75 when they joined the Sutton and Skegby section 'C' and with a talented bunch of youngsters won the championship. Nine more years went by in the S & S before they moved onto the Central Midlands league. They have now enjoyed a 17 year stay in this league, enjoying good times and bad. In the late nineties they were in danger of folding but rose from the ashes to gain promotion to the Supreme Division in 1999 for the 1st time and despite struggling to adapt to this higher standard, they are determined to maintain this level for as long as possible. The club over the years maintained a name for cup kings and the earliest records of this were the successes achieved in the BOLSOVER CUP, a tournament founded in 1895. The WOODHOUSE SHIELD was won in 1967-68 when Blackwell MW beat Old Whittington, but the next year they lost 1 -0 to Bolsover MW. In 1912-13 the team almost won the Derbyshire Divisional Cup (Erewash Division) but went out at the semi-final stage when they lost in front of a crowd of over 1000 to Tibshelf. The score being 1--3 on 1st March 1913 and was the first reversal for Blackwell since the previous September. Strickland had scored an early penalty for the 'Dandies', a nickname given to the team in those days, but Holt soon equalised before Tibshelf went onto win. In the Sutton and Skegby years the team had success in the Derbyshire Cups, winning the Junior Cup in 1977/78, 1982/83, 1983/84 and being runners up in 1976/77. They also won the Section 'A' cup in 1976/77 They were DCFA Divisional Cup winners in 1984/85 In the Central Midlands league they have been Senior Division winners in 1984/85 and runners up in 1985/86. They won the Senior Division Cup in 1984/85 as well as the league. In 1987/88 they became the Division One Cup winners and were runners up in the Premier division in season 1990/91. That was also the time when bingo was introduced in the town. If you're into this game, you'd like to see the top bingo websites reviewed. The above team was assembled to play in the Notts Alliance and after joining in 1951/52 they finished third in their first two seasons and then in 1954/55 they won the league 9 points ahead of Eastwood Town. They drew 1 and lost only 2 of their 26 games scoring 104 goals, conceding 38. They also were runners up to Boots Athletic in the Notts. Alliance Cup Final. They lost 6--3 in front of over 6000 people at Meadow Lane, Nottingham on 6th May 1955. Blackwell was emptied that day with many trains and coaches taking the supporters to the game. Many of the players were employed by the colliery companies and it was not unusual for the players to be released from the shift early in order that they could go to train or play in games. The village produced many good 'home-grown' teams and everyone turned out to see family, friends and work-mates in action. One record from a treasurers account showed an entry for one game of £40 gate money @ sixpence each. This equates to 1600 paying customers. More about club development.